Is there a tree stump you have been meaning to have removed? Let RJS Tree Service help with the removal. RJS Tree Service provides stump removal for any size tree stump. We can remove your stump when we cut down your tree, or you can call us at a later date for stump removal. 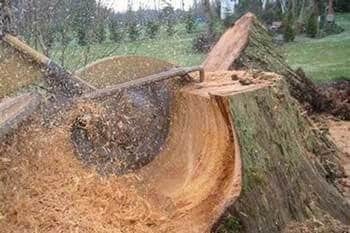 With our stump grinding machines, we can remove any unsightly stump from anywhere on your property. A stump grinding machine mechanically grinds the stumps below the soil line. Stump grinding is the most effective way to remove stumps without unnecessary property damage. Our stump removal equipment is designed to be quick, unobtrusive, and effective. We don’t tear up your yard and we don’t leave ruts. Stumps in hard to get to locations like flowerbeds, near fences and close to your house are not a problem for our equipment. We specialize in stump and root removal/grinding. The tree is gone! The base of the tree (stump) serves no purpose. Tree stumps breed ants, termites, bugs, bees, and rodents…then it’s homeward bound…avoid costly termite and pest control services. Stumps are UGLY! Beautify your yard. Grow grass. Replant! Stumps and their surface roots are tripping hazards. Exposed roots and stumps also bend crankshafts on mowers.